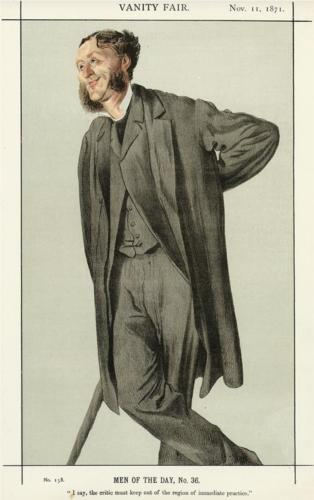 This caricature was published in the 11 November 1871 edition of Vanity Fair. It was part of a series that included caricatures of other “Men of the Day,” including John Ruskin and John S. Mill. Following the caricature is a line from “The Function of Criticism at the Present Time”: “I say, the critic must keep out of the region of immediate practice” (Arnold, Complete Prose Works III.275). Arnold delivered “The Function” in lecture form as Oxford Professor of Poetry on October 29, 1864, and published it shortly thereafter in The National Review. Tissot lobbed the first public shot towards Arnold’s caricatures in the popular press, for his image is the first published caricature. In the book In ‘Vanity Fair’ by Roy T. Matthew and Peter Mellini, the authors provide an excellent description of the French painter James Tissot’s caricature of Arnold as well as some background information about Arnold’s relationship with the magazine at the time. They write, “Vanity Fair acknowledged that Arnold was ‘eminently fitted’ to be a critic because of his extensive writings and experiences. The magazine recognized that Arnold had not been appreciated or understood for his efforts to ‘propagate the best that is known and thought’. […] The magazine admitted that, as a critic, he was ‘unsurpassed’; however, Vanity Fair disapproved of his proposal to increase the power of the State to solve England’s problems. Tissot’s caricature captures Arnold’s sense of elegance which he inherited from his mother. Charlotte Bronte, upon meeting Arnold, wrote ‘Striking and prepossessing in appearance, his manner displeases from its seeming foppery’. Arnold’s serious side, which Bronte appreciated, could not hide his dandyism. He was particularly vain about his hair which he anointed with French lotions. Tissot emphasizes Arnold’s hair and his mutton chop whiskers. His foppery is tempered by his clerical attire, but Tissot has caught the essence of his victim” (91). Matthew and Mellini call attention to the languid pose and the quasi-aesthetic elegance that Tissot captures in the caricature, but Tissot’s pose is meant also to highlight what R.H. Super rightly calls the “keynote” of the essay from which the cartoon’s caption comes: “disinterestedness” (Super, Complete Prose Works 473). Of all of Matthew Arnold’s famous phrases, “disinterestedness” in all of its connotations has perhaps caused Arnold’s very practical critical legacy the most difficulty. The fact that Arnold’s eyes are clearly turned up accentuates a perceived removal or aloofness from the otherwise earnest tone of most Victorian social and intellectual critics. His cool smile suggests an almost willful ignorance of many very real Victorian social concerns. Tissot is capitalizing on both of these in his caricature. Just how amused Arnold himself was with the caricature is difficult to ascertain. In a letter to his mother of November 19, 1871 (only a few days after the caricature was printed), he writes, “You will hardly have even been amused by Vanity Fair, it was so unlike. Something of a resemblance people find in the figure and attitude, but no one, I think, finds any in the face.” Displacing the dislike of the cartoon onto his mother seems rather like an admission that he does not find the caricature amusing. This letter is the only one in which he mentions the likeness. Arnold is right, though, about the lack of likeness in the face. Contrasted with the other caricatures presented here, Tissot seems to have neglected the most oft-exaggerated features – the nose and mouth. Arnold’s mouth in this picture is close to pursed, and his nose is rather proportional to his face. Moreover, Arnold’s strong chin seems softened, as do his cheeks. However, as Matthew, Mellini, and Arnold all note, Tissot does capture Arnold’s demeanor, at least as he was presenting himself through his prose works.